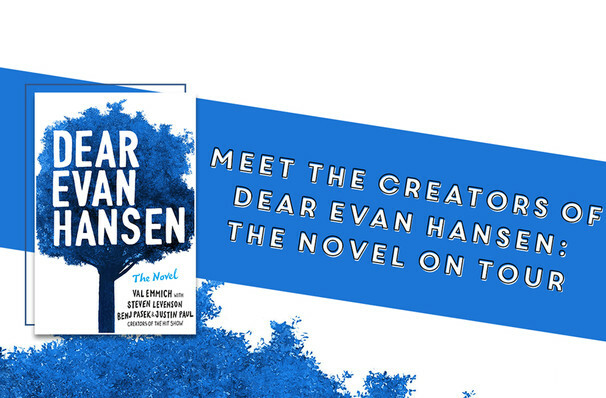 Why See Dear Evan Hansen Book Tour? In 2016 Dear Evan Hansen set Broadway alight with its poignant portrayal of the troubled waters of teendom, garnering six Tony Awards, including Best Musical and Best Score, just a year later. Still currently reigning on the Great White Way at the Music Box Theatre, the critically acclaimed story is set to be immortalised in a page-turning young adult novel written by American author Val Emmich and the show's creators Steven Levenson, Justin Paul and Benj Pasek, due for release on October 9th, 2018. Due to the often once-in-a-lifetime nature of attending a Broadway show for many youngsters across America, its creative team hope to make Dear Evan Hansen more accessible to a wider audience by setting it down on paper. It's relatable story follows titular character Evan, an invisible high school senior with social anxiety who becomes tangled in the aftermath of a classmate Connor's suicide after a lie he tells snowballs with heartbreaking consequences for Connor's family, Evan and his crush Zoe. Touching on themes of mental illness, youth suicide, self worth and the struggle of growing up, the musical, and now book, have become an anthem for parents and teens alike. Don't miss its official 10-city book tour, featuring Emmich, Levenson, Paul and Pasek, who'll be reading excerpts and performing songs from the show! Sound good to you? Share this page on social media and let your friends know about Dear Evan Hansen Book Tour at University Temple United Methodist Church. 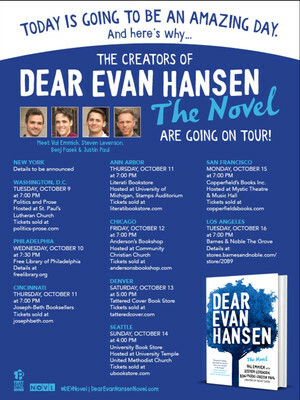 Please note: The term University Temple United Methodist Church and/or Dear Evan Hansen Book Tour as well as all associated graphics, logos, and/or other trademarks, tradenames or copyrights are the property of the University Temple United Methodist Church and/or Dear Evan Hansen Book Tour and are used herein for factual descriptive purposes only. We are in no way associated with or authorized by the University Temple United Methodist Church and/or Dear Evan Hansen Book Tour and neither that entity nor any of its affiliates have licensed or endorsed us to sell tickets, goods and or services in conjunction with their events.